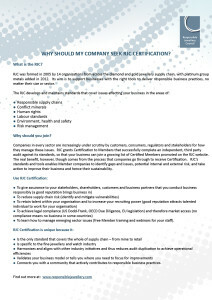 To see the benefits of RJC Certification please click here. Submit a complete and accurate application form. Annual Membership Fee Rates are in the table below, and are scaled to the size of the business. The ends of the supply chain (producers and retailers) pay slightly higher fees than the middle of the supply chain. There is a minimum fee for smaller businesses, and a maximum fee for larger businesses. These fees are designed to be cost-effective for access to a comprehensive and tailored CSR platform for the jewellery supply chain. Membership fees do not include the cost of the independent, third party auditing that is required to achieve Certification. 0.006% of Annual Relevant Sales* (ARS) The above percentage translates to $60.00 per million dollars of Annual Relevant Sales. 0.004% of Annual Relevant Sales* (ARS) The above percentage translates to $40.00 per million dollars of Annual Relevant Sales. *Annual Relevant Sales (ARS) is defined as “the total sales derived from those parts of the applicant’s business that are directly involved in the diamond, gold and/or platinum group metals supply chain. 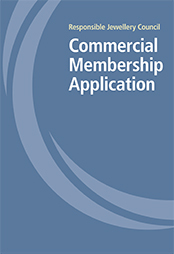 Please refer to the Commercial Membership Application Form for further details.